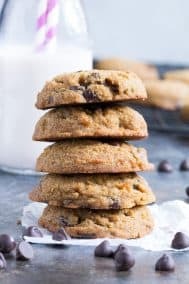 Soft, chewy, and decadent, these Paleo Pumpkin Chocolate Chip Cookies will quickly become a family favorite! 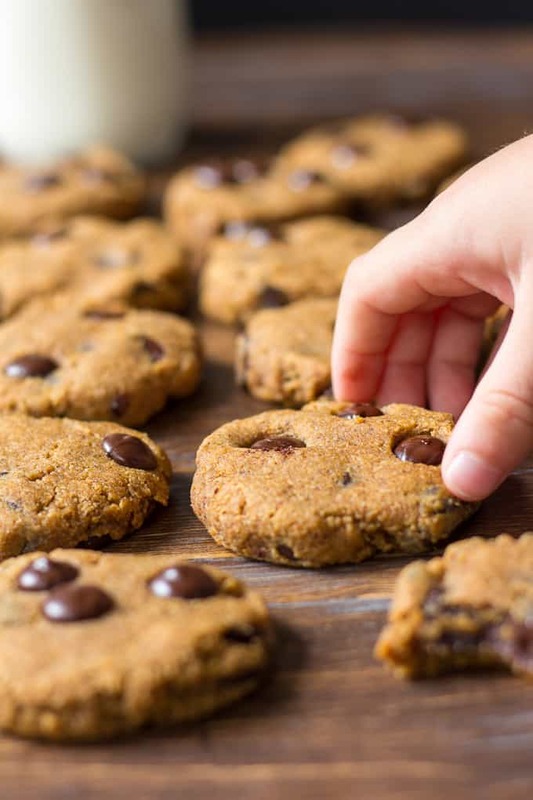 With thick, soft, fudgey texture and rich warm flavors, you won’t believe these cookies are grain free, dairy free, and Paleo. More cookies, please! Yup, that’s what she said. And by “she”, I mean “me.” I hope you all can share my cookie love, because what we have on the agenda today is some serious Paleo cookie-osity. Or something similar. Go ahead, make it your own! 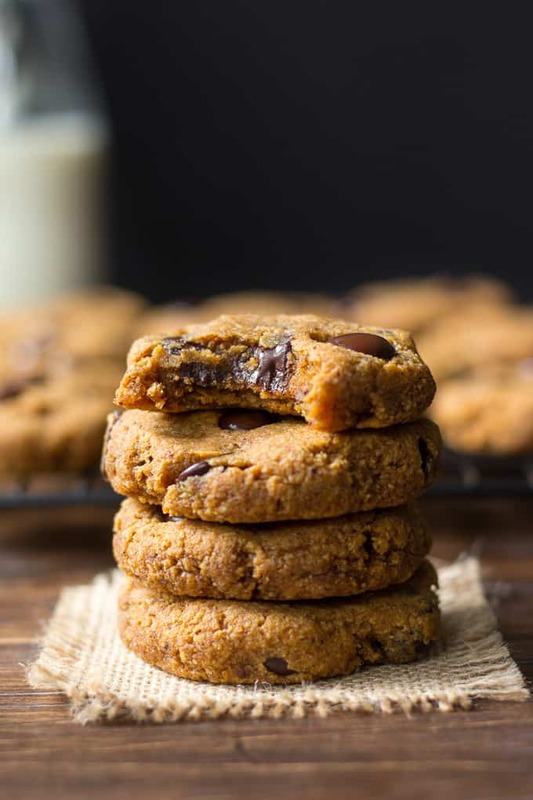 All eyes on the cookies now – these Paleo Pumpkin Chocolate Chip Cookies aren’t difficult to look at, or eat – I’ll tell you that much. The inspiration for these cookies came from three places: 1.) My pumpkin fudge cookies from last year 2.) My desire to eat chocolate everyday and 3.) The pumpkin-obsessed world we live in August-December. I can’t lie – the pumpkin insanity this time of year makes me want to put pumpkin puree in basically everything. Everything food related, I mean. Not the bathtub or anything weird like that. The moment the “photos are done” announcement happens, of course, we’re fighting over them. The biggest, the one with the most chocolate – which would be your pick? And, just as a side note, my kids do know what “real” gluten-filled treats taste like, and, they still truly loved these cookies. As did Adam and my parents, who also still remember the taste of non-Paleo cookies, or so I assume. I’m honestly not sure what I’d do without my very-honest kids when it comes to recipe creation. Trust myself? Hire a taste tester? 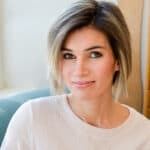 Risk my marriage by having Adam critique my recipes? I mean, I think he’s sort of honest about what he likes, but, I prefer to trust the kids. The more they fight over who gets the last bite or the bigger piece, then I know I’ve won. 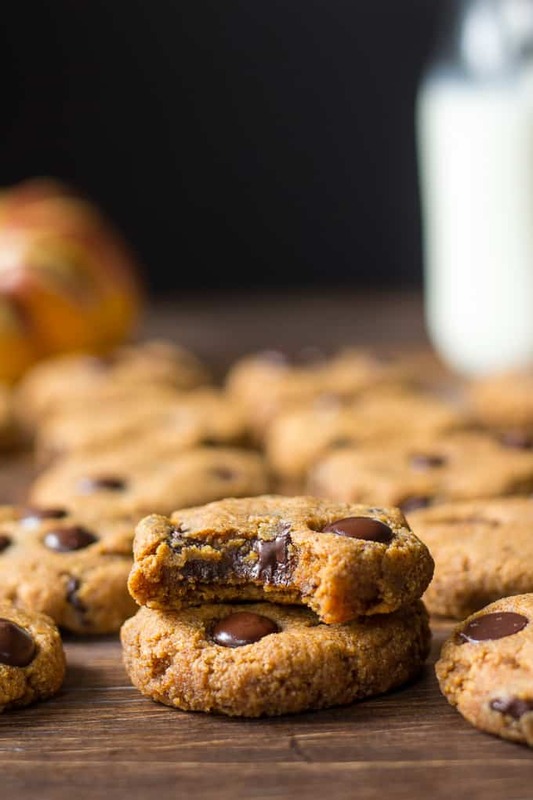 The Paleo Pumpkin Chocolate Chip Cookies win! A quick note on this recipe – it makes a lot of cookies! 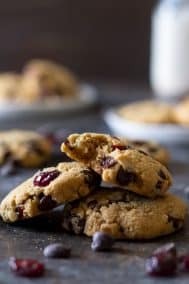 I have made the recipe twice and the first I made 20, the second 24 cookies – I actually prefer bigger cookies, and, if you make them bigger the bake time won’t be much different, maybe a minute longer. They’re super soft – in fact, they seem to get softer as they cool. They save very well in the refrigerator too which makes them perfect for after school snacks all week long. I hope you guys enjoy these as much as we do! Let’s start baking! 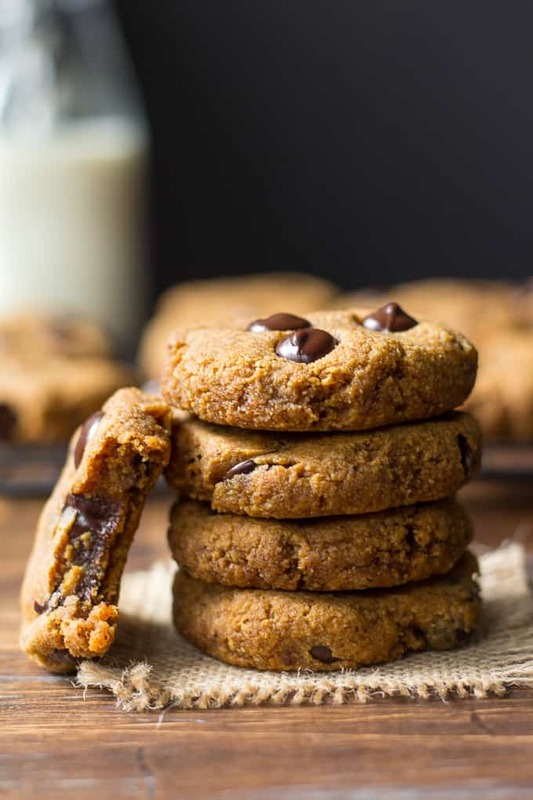 Super soft and chewy Paleo pumpkin chocolate cookies with plenty of chocolate and a hint of cinnamon and pumpkin pie spices. 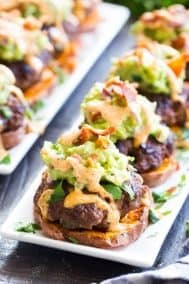 Paleo, grain free, dairy free and absolutely delicious! Preheat your oven to 350 degrees and line 2 cookie sheets with parchment paper. In a large bowl, whisk together the egg, almond butter, pumpkin puree, coconut sugar and vanilla. 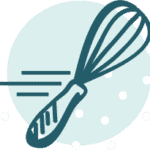 In a separate mixing bowl, combine the blanched almond flour, sea salt, cinnamon, pumpkin pie spice, and baking soda. Once the dry mixture is well combined, slowly mix it into the wet ingredients until fully absorbed and a cookie dough forms. Lastly, stir in the dark chocolate chips. The dough will be sticky - I recommend chilling it in the freezer for 10-15 minutes at this point. Once the dough is chilled, roll into 24 balls, or use a cookie scoop to form round, even scoops on both cookie sheets. With a separate piece of parchment paper, flatten each ball into a cookie shape of about 1/2 inch thickness. Bake in the preheated oven for 10-12 minutes or until just set. Remove from oven and allow to sit for a minute before transferring to wire racks to cool completely. Store leftovers covered in the refrigerator. Enjoy! *Enjoy Life Brand chocolate chips contain no dairy or soy and have been my favorite for years! If you want to avoid cane sugar, you can make your own paleo chocolate chunks with this recipe. 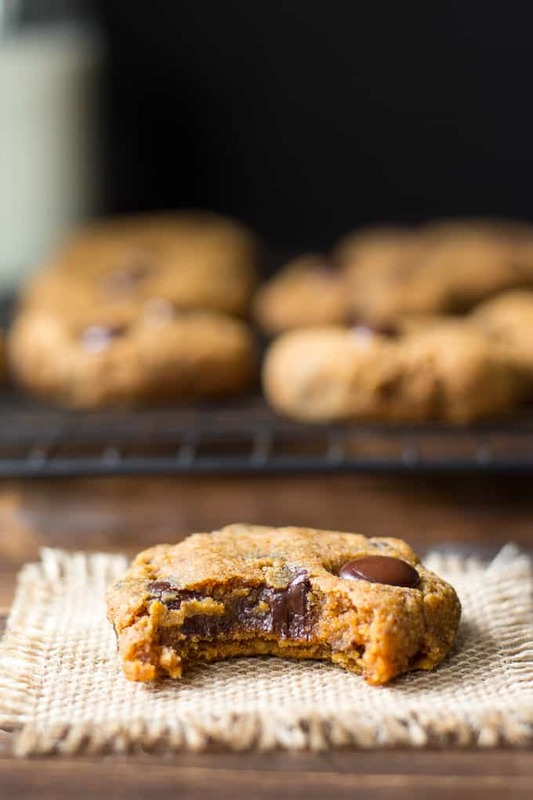 Want more Paleo pumpkin treats? Try one of these! Is your family brutally honest about how recipes turn out? What’s your current favorite sweet treat? ha, you know my son is brutally honest with everything I make. it’s rare that anything I make is good according to him but that’s only because healthy, organic, meatless or anything that comes from trader joe’s is bad right now. gotta love this age! When that happens they will cook their own dinner and pay for it too, lol! I scoured this page repeatedly, saw every ad and every pop up three or four times – but what I never found was the referenced recipe. I hear you – a dozen doesn’t go far over here with 5 people! I’m thankful I have really honest siblings too; sometimes it’s hard for me to take, but it’s actually really good for me. Reading your thankfulness for your kids as recipe testers made me think about my siblings in a more thankful light. Thank you! 🙂 And putting pumpkin in chocolate chip cookies isn’t a bad idea! I would love to try that. There is definitely a line between good honest and rude honest, I try to teach my kids that when they tell me they don’t like something! I don’t know about brutally, but my family definitely let’s me know when something isn’t too great. Although their favourite way to say it is: “Mmmm. I’m just not sure” 😆 These look amazing! That is definitely polite of them! These look amazing!!! Can’t wait to try after my Whole30. Thanks Becky 🙂 Pumpkin will still be going strong after the 30 is up! Michele, I want to eat my screen!!!! I just look at my sister or mum’s face and it speaks volumes ha! Hi there. I made these last night and the taste was good. The texture was not quite what I was hoping for though. I substituted a 1/4 c xylitol for the coconut sugar. They were very cake-like and kind of dry tasting. 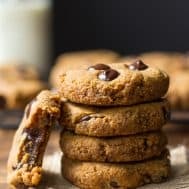 How might I achieve something more towards a standard chewy choc chip cookie? Add butter or another oil? 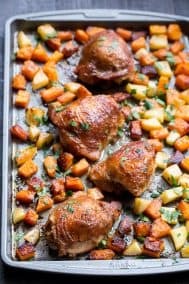 I realized after the fact that there wasn’t much oil compared to a standard recipe. Thanks! 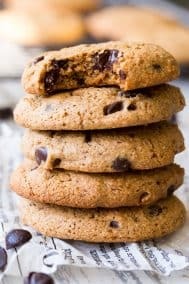 It’s also possible they were a bit overbaked, I find paleo cookies are really sensitive to overbaking so you may want to simply drop a minute off the baking time and see what happens. Ok thank you!. I’ll try that one. These cookies are amazing! Definitely going on my favorites list. Do you happen to know about how much fat and calories are in each cookie? Omg!!! These are totally amazing! I’ve been paleo for 3 years and this is my first cookie recipe and I’m in heaven! They may not be “diet” but they are an awesome treat!!! Yay! Thrilled you liked them! 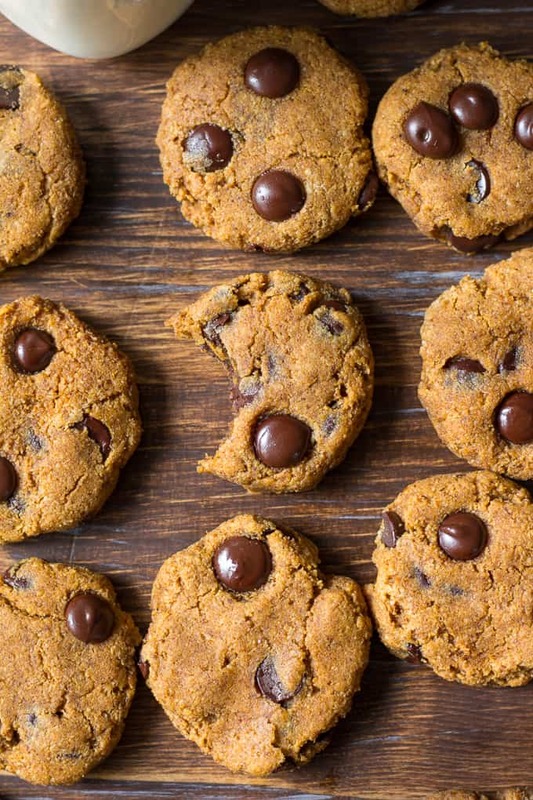 Do you the calories per cookie by chance? It was really good thanks for the recipe! But there was just one thing I did everything it said and it only made 18? Depending on how big you make them I’d say 18-24 is normal so no worries 🙂 Glad you liked! Oh my gosh these are almost too delicious! 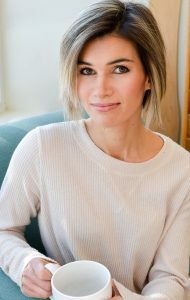 We just finished Whole 30 and felt like celebrating–glad we didn’t choose another way! These have just right amount of sweetness and a perfectly chewy texture. Will definitely make again! Thank you! Thank you for sharing this deliciousness with my family! Can I leave out the sugar or sub it for syrup or honey? I was just scrolling because I was wondering the same thing! Did you ever try with honey by chance? Those cookies are so delicious. But how come mine didn’t come out that pretty looking?? Lol. I did the exact same ingredients and measurements. And my look darker. Help! After I made these cookies and stored them in a Tupperware for a few hours, they turned green! Any idea why?! I made these cookies and they turned out wonderful but my husband thinks they won’t be sweet enough for the classroom party I’m trying to make them for with kids that might only ever get very sugary treats. Do you think they will bake ok if I increase the coconut sugar by another half or should I try cane sugar? I just want to sweeten a bit but need them to stay the same consistency…. Don’t want to make crumbly ones. Thoughts please? Delicious cookies!!! 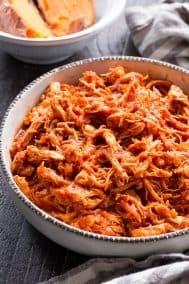 Super simple and easy to make. These look amazing – can i use monk fruit as a sweetner instead of coconut sugar? 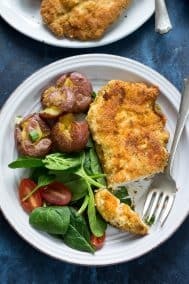 Can I substitute a gluten free baking mix for the almond flour and baking soda? Would it be a direct conversion do you think? Any recommendations on making the dough ahead of time and freezing? 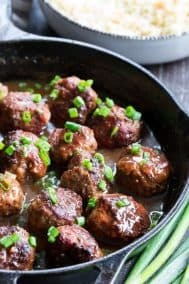 Maybe shaping in balls and then freezing? Please let me know your thoughts as I don’t bake much. Thank you!